If you have been in any of the above situations then this post is for you. Apart from knowing git add, git commit , and git push , there are a bunch of other important techniques in Git. Knowing these will help a lot in the long run. Here I will be covering some of the things which will enable you to make the best use of Git. Whenever multiple developers are involved in a project it is necessary to use the right workflow for Git. Here I will be covering one workflow which is very effective in big projects with multiple developers. The Master Branch should always have a copy of the existing code in Production. No-one — including the tech lead — should be coding directly in the master branch since it is a copy of production code. The actual code is written in other branches. When the project begins the first thing to do is to create a release branch for the project. 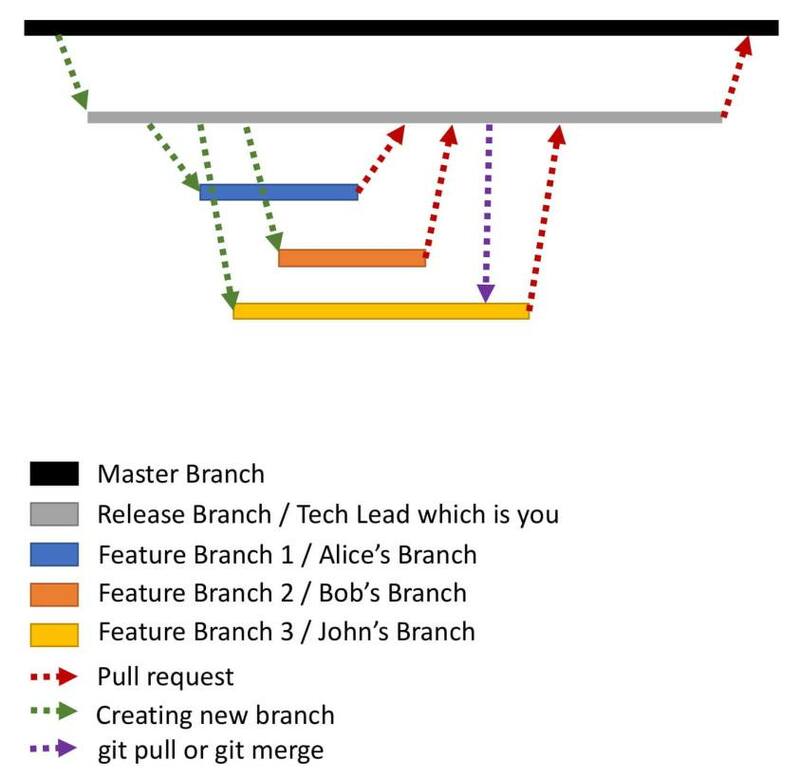 The release branch is created from the master branch. All code pertaining to this project will be in the release branch. The release branch is just a normal branch with the prefix release/. Let’s call the release branch for this example release/fb. The reason to have a release branch is that the same code base can have multiple projects running in parallel — there should be no conflict between the projects. Now you, being the tech lead, have asked Alice to build a login screen for Facebook. So she creates a new feature branch for this. Lets call the feature branch feature/login. Alice would write the entire login code only in this feature branch. Now, let’s say that Alice finished her task and the login code is ready. She needs to send her code to the release branch release/fb from her feature branch feature/login. This is done through a pull request. First and foremost, a pull request is not to be confused with git pull . The developer cannot push the code directly into the release branch. The tech lead needs to review the feature code before it goes into the release branch. This is done through a pull request. Alice can raise the pull request as follows in GitHub — these steps are specifically for GitHub. the base branch should be the release branch release/fb. Once this is done, Alice needs to enter a title and description for the pull request, and finally click on “Create Pull Request”. Alice also needs to assign a reviewer for this pull request. She enters your name as the reviewer since you are the tech lead. Bob has completed his code as well, and has raised a pull request from feature/friendrequest to release/fb. Since the release branch already has the login code, code conflicts occur. It is the responsibility of the reviewer to resolve these code conflicts and merge the code. In this case, you as the tech lead need to resolve these code conflicts and merge the code. Now John has also completed his code and wants to add his code to the release branch. But John is pretty good at handling code conflicts. John takes the Latest code from release/fb branch into his own feature branch feature/newsfeed ( either through git pull or git merge ). John resolves all the conflicts that are present. Now the feature/newsfeed branch has all the code present in release/fb as well. Finally, John raises a pull request. This time there are no code conflicts in the pull request since John has already resolved them. First method: the reviewer of the pull request needs to resolve the code conflicts. Second method: the developer ensures that latest code from the release branch is merged into the feature branch and resolves the conflicts themselves. Once the project is completed, the code from the release branch is merged back into the master branch. The code is then deployed to production. Thus, the code in production and the code in the master branch are always in sync. This also ensures that, for any future project, the up-to-date code is available in master. More information about pull requests is here. You now know how to make the best use of Git. Git has some other concepts like amending commits, and rebasing which are also useful. But Git workflow is pretty important for big projects to be successful.